As part of the new sponsorship arrangement, Holley Optometrists will choose who they believe was the best Coleraine FC player on the park, as well as offering tickets and signed memorabilia throughout the season. 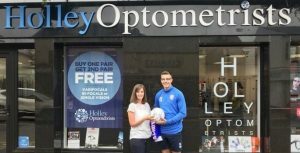 It marks the first sponsorship deal of its kind in Irish League football and it further enhances the ongoing relationship between Holley Optometrists and Coleraine Football Club. Colin McKendry, Chairman, commented: “We are delighted with this generous sponsorship by Holley Optometrists to sponsor every Man of the Match Award this season. “They are a highly regarded local business providing an essential service to the local community and as a community club we would encourage our fans to support Holley’s by having your eye test carried out by them. Holley Optometrists is an established optical practice based on Railway Road, Coleraine. They first opened their doors in 1985 and have been providing comprehensive eye examinations, glasses and contact lenses to all ever since. Holley Optometrists’ aim is to deliver an exceptional experience for all patients and customers using the latest technology. Practice Manager, Julie Mitchell, said that the local business is ‘delighted to be associated’ with the Irish Cup holders. “We love what we do and are delighted to be associated with Coleraine Football Club.